What would you do if you knew that someone you love is not who you thought he or she was? Crazy, right? Take a peek into the world of Asia’s rich and famous with Kevin Kwan’s film adapted novel, Crazy Rich Asians! 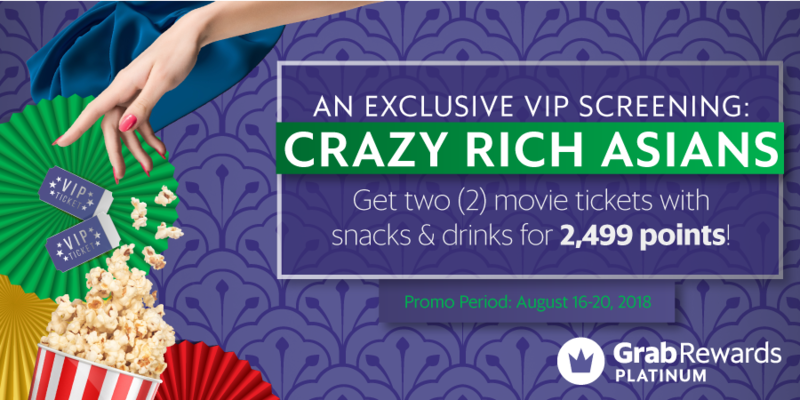 From August 16 to 20, Grab Platinum users can get two (2) movie tickets complete with snacks and drinks for 2,499 GrabRewards points to the screening of Crazy Rich Asians on August 22, Wednesday at Bonifacio High Street Cinemas! Open your Grab app. Go to GrabRewards. On August 22, go to the Grab Platinum Station (located behind the Bonifacio High Street Cinemas ticket counter) to claim your movie ticket and for the VIP screening. Don’t miss out and watch out for more rewarding experiences with Grab Platinum! Grab Platinum user must present the redeemed Crazy Rich Asians reward to the Grab representative for verification. After verification, Grab representative will hand over two (2) movie tickets and and two (2) claim stubs for popcorn and drink to the Grab Platinum user. Value of the Crazy Rich Asians reward is 2,499 GrabRewards points. Promo is open to Grab Platinum users only. Promo is valid from August 16 to 20, 2018 or until supplies last, whichever comes first. Each Grab Platinum user can redeem the reward once within the promo duration. Each redeemed reward entitles the Platinum user to two (2) movie tickets and two (2) sets of popcorn with drink. GrabRewards points refund is not allowed once reward is purchased/redeemed. The promo can be suspended or cancelled at any point in time without prior notice. Grab reserves the right to change the terms and conditions at any point of time. Failure to redeem the reward within the validity period will render the winner invalid. Movie tickets are transferable but not convertible to cash. Movie tickets that will be issued are reserved seating. Strictly no exchanging of screening schedule once reward is redeemed thru GrabRewards and ticket has been issued to the user. Per DTI-FTEB Permit No. 14101 Series of 2018.